Apart from looking cool, the idea makes practical sense. Many Chinese cities have severe congestion problems and need more public transit options. Buses can get bogged down amid the slow crawl of cars unless they have their own lanes, and if they do get their own lanes, they're hogging up road capacity. Not a problem for the straddling bus. Likewise, subways are sleek and convenient, but they're also expensive and take a long time to build. All that's involved in a straddling bus is refitting the roads and building station platforms—planners estimate that a system costs just 10 percent of a comparable subway option. 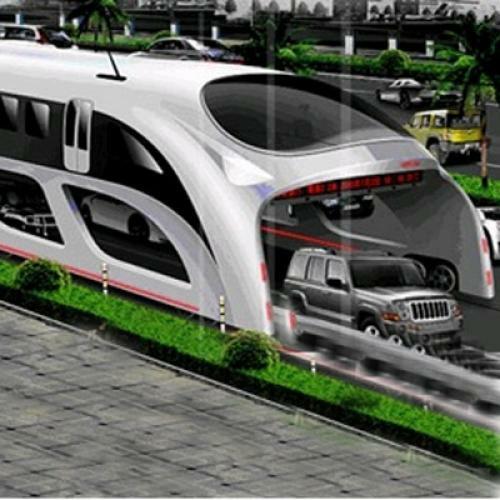 Of course, as Ryan Avent would tell you, these fancy new buses won't, on their own, solve China's congestion problem. The primary source of woe is that space on the roads is a valuable good that's kept artificially cheap. So demand outstrips supply and, voila, instant parking lot. Congestion pricing at peak hours would solve this problem, and the money raised could be plowed back into transportation alternatives—like, well, shiny new straddling buses.